The first human stem cell line with the mutation for cystic fibrosis (CF) has been developed by UK researchers. 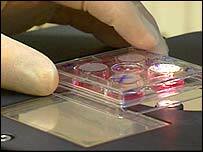 The cells could help the development of treatments for the disease, which affects more than 7,000 British people. Dr Stephen Minger of King's College London said the cell lines would be useful because animal models for CF had not proved applicable. Three people a week die from CF in the UK. The research was presented at the BA Festival of Science in Exeter. The disease causes an abnormally thick, sticky mucus to be produced in the body, causing chronic inflammation of the lungs leading to life-threatening infections. "I think if you can take embryonic stem cells and you can differentiate them into epithelium [lung tissue] then you have a cell type which will be physiologically relevant," Dr Minger told the British Association's annual meeting. "People have been trying to make animal models of CF for years and they haven't been very good. So my hope is that these would be useful." The King's team cultured cell lines homozygous - possessing two identical forms (alleles) of a specific gene - for the delta-508 mutation, the most common genetic mutation associated with cystic fibrosis. This is a three-base pair deletion, when a part of a chromosome or DNA code is missing, which means a protein does not fold properly and does not make it through the membranes of cells. "Despite that they seem to be analogous to all our other stem cell lines in their behaviour and phenotype," said Dr Minger. "We've had a couple of researchers from the US who have wanted to gain access to these cell lines, but they have been told by their universities: 'under no circumstances'." He also gave details of his current progress producing therapeutically useful stem cell lines. "We've spent a lot of time trying to manipulate the cells with growth factors and substrates, but that hasn't worked very well. "The one we're going with long term is important [genetic] transcription factors and over-express them in the cell," said Dr Minger. Transcription factors are proteins that help synthesise a molecule called RNA which performs other useful functions in the cell. When these factors are over-expressed, their activity is enhanced. Another research group at the University of Chicago have produced embryonic stem cell lines with a variety of mutations for diseases, but these have not yet been fully characterised, Dr Minger claims. Last year, Dr Minger and his team became the first to grow human embryonic stem cells in the UK. The research is currently under review in a medical journal.